For a good portion of my life I’ve boasted about the shark (which has steadily grown in size and fight with each re-telling of the story) I caught on a hand line as a young lad. So I fancy myself pretty handy with the old rod and reel. Recently I felt it was time to add to my ‘old man and the sea’ stories and go deep-sea fishing, and I intended to do it right on a proper boat and the right gear. So when a friend of mine was coming up for his fortieth I saw my chance and cast out some off the cuff suggestions to guide his decision on an appropriate celebratory activity, to go ‘proper’ fishing. You see I had long wanted to get such a trip past my wife, so I had ulterior motive. 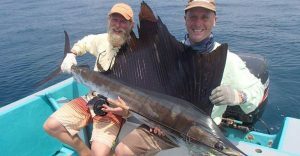 And of course the bait was taken and last weekend we were booked on a proper deep sea fishing trip. 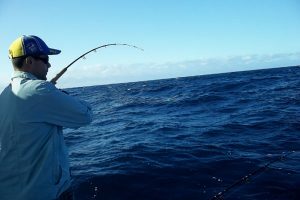 I had it all lined up with Deep End Fishing Charters, of Mooloolaba. I’d heard some great things from friends who enjoyed their fishing as much as I did and checked out their website. They had a number of day and night trip packages available for a range of prices, but we went for a customised package to get the most out of our trip, and to keep the reef all to ourselves. The day came and we rocked up at 6am to start our 12 hours of head to head fish war. The boys turned up in full BCF top-of- the-line fishing gear, all obviously brand new (except me of course), and had never looked so ready. The rigs were being prepared and the boat was stocked. We were ready to catch something of biblical proportions. The day began with a thorough briefing session from the crew on everything from rigging, to baiting, to casting technique and reeling strategies. These guys were good, really good. If anyone could help these no-hopers who I call my best mates, keep up with me – this crew could. We reached the first fishing spot over a reef and started casting. My time was now, or so I believed. I will admit, it was a shaky start to the day for me – some poor casts made due to the sun in my eyes, random gusts of wind and the distraction of friendly barbs. I soon had my technique down pat again; I merely needed to shake off the rust. The first few fish to be landed were not mine; in fact it took quite a while for me to shake off the rust and get my first bite. 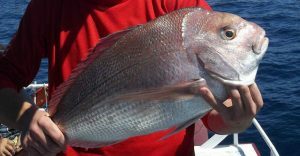 I figured it had to be the side of the boat I was on, my bait was wrong for the type of fish below, or maybe my friends were cheating. After the first few hours went by without so much as a nudge from my aquatic nemesis, I had to admit to myself that it was simply bad luck and impatience holding me back. We moved on from spot to spot, and as we did I started to relax and focus on the journey rather than keeping a tally of catches. The crew took fantastic care of us and being in the company of my best friends – I couldn’t have asked for a better way to spend a day out on the water. 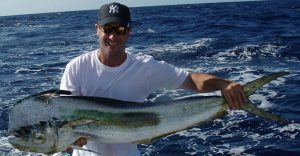 I, of course, ended up with a plethora of catches the sizes of which would boggle your mind, but I won’t brag… instead I’d only urge you to give DeepEnd Fishing Charters a look see, and maybe take them up on one of their great offers, because you certainly won’t regret having so much fun. You can find more information on the group at their website.